2. Exemplified – The actual event of the Assumption is not described in Scripture. However, there are “assumptions” recorded in the Scriptures and the concept is thus biblical. Some say Moses too was taken up since his grave is not known. As we read in yesterday’s first reading at Mass: He was buried in Moab, in the valley opposite Beth Peor, but to this day no one knows where his grave is (Dt. 34:6). The text of course does not say his body was taken up and if it was, it occurred after death and burial. Jude 1:9 hints at the fact when is says, But even the archangel Michael, when he was disputing with the devil about the body of Moses….. (Jude 1:9) Some further credibility is lent to the view of him being assumed by the fact that he appears alongside Elijah in the Transfiguration account. Some of the Church Fathers held this view and there is also a Jewish work from the 6th Century AD entitled The Assumption of Moses that represents the tradition of his assumption. But in the end the Assumption of Moses only a view held by some and it not officially held by the Church. The Woman is clearly Mary since the child is clearly Jesus (though she also likely allegorizes other realities such as Israel, and Mother Zion). And where is Mary seen? In heaven. Now some may argue the text does not necessarily indicate her body is in heaven but may only be referring to her soul. However the physicality of the description of her is rather strong. Some also argue that Mary is linked to John’s sighting of the Ark of the Convent which is seen by John in Heaven. He mentions the Ark and goes on to describe the woman clothed with the sun (Mary) and there is a possibility that he is still describing the Ark he sees in Heaven. (I have written on this elsewhere. See here: Mary: The Ark of the New Covenant) If she is the Ark described that Ark is clearly described as being in heaven. 3. Extended – The Feast of the Assumption may be of theological interest to some and may provide for interesting biblical reflection but eventually the question is bound to come: “So What?” How does what happened to Mary have impact on my life and what does it mean for me? The answer to this question is bound up in nearly every Marian Doctrine. Simply put, what happened to Mary in an profound and preliminary way will also happen for us in the end. As Mary bore Christ into he world, we too bear him there in the Holy Communion we receive and in the witness of his indwelling presence in our life. As Mary is (and always was) sinless, so too will we one day be sinless (immaculate) with God in heaven. As Mary cared for Christ in his need, so do we care for him in the poor, the suffering, needy and afflicted. And as Mary was assumed, body and soul into heaven so too will we be there one day, body and soul. Yes we shall also be taken up, assumed, and then shall be fulfilled for us the saying of Job: I know that my Redeemer lives, and that in the end he will stand upon the earth. And after my skin has been destroyed, yet in my flesh I will see God; I myself will see him with my own eyes—I, and not another ‘s (Job 19:25-27). The assumption of our bodies, prefigured by Christ in his own power and also in Mary by the gift of God, will one day be our gift too. For now, it waits till that “great gettin’ up morning.” Until that day, and on that day, fare you well, fare you well! This song is an African American Spiritual and speaks of that Great Gettin’ up morning when our bodies will rise. And if we have been faithful they will rise to glory! I’m gonna tell you about the coming of the judgement (Fare you well) There’s a better day a coming….In that great gettin’ up morning fare you well! Oh preacher fold your Bible, For the last soul’s converted….Blow your trumpet Gabriel…..Lord, how loud shall I blow it? Blow it right calm and easy Do not alarm all my people….Tell them to come to the judgement…….In that great gettin’ up morning fare you well. Do you see them coffins bursting? Do you see them folks is rising? Do you see the world on fire? Do you see the stars a falling? Do you see that smoke and lightning? Do you hear the rumbling thunder? Oh Fare you well poor sinner. In that great gettin’ up morning fare you well. We briefly step out of the “green” of Ordinary Time (tempus per annum) to celebrate the birth of the great and last Prophet of the Old Testament, St. John the Baptist. And in so doing, we do not only commemorate a great prophet of history, but we also consider the office of prophet, an office to which we are summoned by our baptism. Therefore as we consider John the Baptist, we also learn of ourselves in terms of our duties both as a prophet and also as one who must be open the proclamation of those who are appointed prophets to us. Lets consider four aspects of the life and ministry of John the Baptist. “Surely the day is coming; it will burn like a furnace. And all the arrogant and every evildoer will be stubble. For the day that is coming will set them on fire,” says the Lord Almighty. “Not a root or a branch will be left to them. But for you who revere my name, the sun of righteousness will rise with healing in its wings. And you will go out and leap like calves released from the stall. Then you will trample down the wicked; they will be ashes under the soles of your feet on the day when I do these things,” says the Lord Almighty. “So, remember the law of my servant Moses, the decrees and laws I gave him at Horeb for all Israel. In other words, time to get ready. Either the Lord will come to us or we will go to him. And the Lord, not wanting us to be lost, sends Elijah, sends John the Baptist, sends the Church, sends parents, priests, teachers and many prophets to prepare us. The great day of judgement dawns for each of us, the Lord in his love sends prophets to prepare us. 2. His PENITENTIAL PROCLAMATION. The second reading today says of St. John the Baptist: John heralded [Jesus’] coming by proclaiming a baptism of repentance. Matthew reports John’s words as being Repent, for the kingdom of heaven is near!….Prepare the way for the Lord, make straight paths for him. (Matt 3:1). So at the heart of getting ready to meet God is repentance. In recent decades there have been some in the Church who have wanted to soft-peddle themes of repentance and frank discussion of human sinfulness and worldliness. But the true prophet cannot prescind from this basic theme. God is very holy, and the holiest among us are the first to acknowledge that it is an awesome thing to fall into the hands of a living and holy God. God is surely rich in mercy, but there is a reason for that: we are sinners. To be sure, repentance is more than a reform of our moral behavior. The Greek word translated here as “Repent” is metanoite which means more literally to come to a new mind, a new way of thinking, to have different and better priorities, to exchange worldly notions for heavenly wisdom. Therefore a true prophet will be steeped in God’s Word, and the teachings of the Church. A true prophet will preach and announce what God reveals and see everything else in the light of it. A true prophet will summon God’s people to truth that God proclaims, and will expose lies and errors for what they are. In summoning God’s people to repent therefore the prophet seeks not only to reform, or inform God’s people, but to transform them by God’s grace. Thus, when God summons us to his presence we will already be well adjusted to the temperature of his glory. Our eyes will be adjusted to the radiance of his love. And our souls will be conformed to the values of his heavenly kingdom. Repent! That is, come to whole new mind, a new way of thinking and understanding, a new heart, a new love, and thus, a new behavior and a new way to walk that makes “straight paths” for and to the Lord. 3. His PERSISTENT POINTING to Christ. John the Baptist was a kind of “rock star” in his own time. It is difficult to underestimate his renown. Such fame is usually the recipe for megalomania and personal disaster. But John humbly points to Christ: What you suppose that I am’ I am not he. Behold, one is coming after me; I am not worthy to unfasten the sandals of his feet. The true prophet points only to Christ, only to God. John did not look to his own glory or fame, he looked to Jesus. He did not look to bottom line and try and figure what it would cost him to follow Jesus, he just looked and pointed. And if anyone did note John’s glory and gifts he simply pointed to Jesus and said, He must become greater; I must become less (Jn 3:30). The true prophet is turned toward Christ, looks for him and eagerly points to him. 1. Who is John the Baptist for you? Surely the Church has this role to be like John the Baptist preparing us to meet God. The Church proclaims repentance points always to Christ. Many scoff at the Church on account of her role, and the gospel and certain aspects of the Gospel go in season and out of season. Yet, though she be a voice as of one crying in the wilderness, still she prophesies: “Repent and believe the Good News! Prepare the way for the Lord! Remember you are dust and to dust you shall return. Seek that which is above, rather than the things of earth!” Yes the Church is surely “The Prophet” for us. Yes, John the Baptist is still present in the prophetic ministry of the Church and others. When you were baptized your were given the office of prophet. Have you taken up this role? Have others been made ready through you to meet God? Think about it? God had John the Baptist, who does He have now. It looks like you. You are John the Baptist! 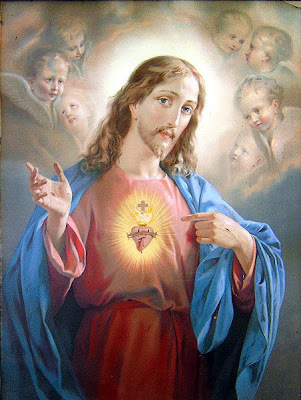 Today is the Feast of the Sacred Heart of Jesus, a feast which celebrates a love that conquers evil by the sheer acts of love and mercy. More on that in a moment. I am afraid that, growing up as a boy and later as a young man, I found the devotion to the Sacred Heart came off as syrupy and sentimental. 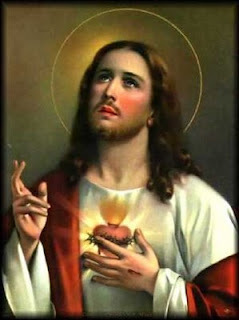 I hope I do not offend but I must say that some of the images of the Sacred Heart present Jesus in an almost feminized manner. His long locks of flowing blondish hair, red lips and an almost “come hither” look were bothersome to me. (For example: HERE & HERE & HERE & HERE) Such qualities look fine on a woman, but not a man. Again, I hope this does not offend. There are surely good depictions of the Sacred Heart out there, I just think some are in bad taste, at least from my perspective as a man. I realize especially that many women do not share my view of such art. But, beyond sentiment this a serious feast. It took time for me, growing up to understand that the devotion to the Sacred Heart was not simply to be identified with the art I saw. Yes, Jesus has a strong, manly and loving heart too, he had a courageous will to save rooted in love. He never hesitated to speak the truth in love. He loved us enough to warn us of sin, and call us to repent. He loved us enough to summon us to sacrifice and taught us that the greatest love was to lay down your life for others. He loved us unto the end, dying for us to bring us salvation, consolation and peace. In the end it was not nails that held him to the cross but love, love for the Father, and love for us. The heart of Jesus contains not just a sentimental love, but a saving and summoning love. His heart is strong and spacious, vigorous and victorious. And his love alone is powerful enough to drive back sin and restore grace. For some reason I am mindful of the Words of Dr. Martin Luther King who sad: Darkness cannot conquer darkness, only light can do that and hatred cannot conquer hatred, only love can do that. And his love conquers in this paradoxical way for it ends the cycle of violence by not returning violence. It ends the cycle of retribution by not paying back, but by forgiving gratuitously. It is ends the cycle of hatred by returning love in the face of hatred. For the Lord’s love stands its ground and will not be drawn into the world of hatred and revenge, will not be defined by them or succumb to their demand to act on their terms. Love conquers simply by being love. The video you are about to see is the furthest thing from sentimental. It is from the passion of the Christ and shows the moment of Christ’s death. But notice how, in the video, love conquers. Shortly after Christ’s death, a soldier thrusts open Christ’s side and reveals the very Heart of God. The way the movie depicts it, Christ’s love, his Holy Spirit almost explodes from his side. And this love “confuses the proud in their inmost thoughts” and “lifts up the lowly.” The Temple leaders are in confusion, the Roman guards are in flight. But Mary, John and Mary are at peace beneath the Cross of Christ. His heart has been revealed. They know his love and are at home with it. Christ’s vigorous love makes Satan howl in frustration and defeat. 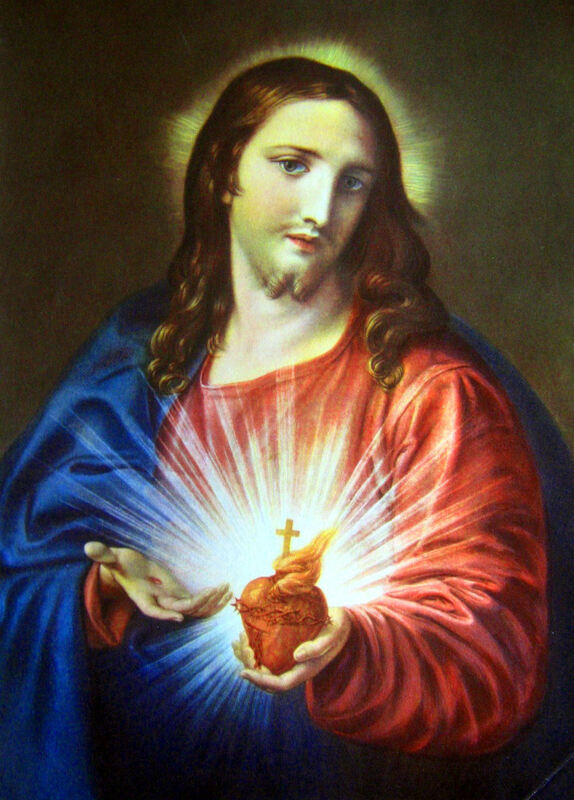 Happy Feast of the Sacred Heart. May you know the tender and powerful love of Christ. This Sunday in many places features the (moved) Solemnity of the Most Holy Body and Blood of Christ, Our Lord. While you may puzzle over my title, allow me to explain it later. On a Solemn feast like this many things occur that might be preached and taught. Allow three areas for reflection: The Reality of the Eucharist, The Requirement of the Eucharist, the Remembrance of the Eucharist. We will look at each in order. A. Luke 22:19-20 And he took bread, and when he had given thanks he broke it and gave it to them, saying, “This is my body which is given for you. Do this in remembrance of me.” And likewise the cup after supper, saying, “This cup which is poured out for you is the new covenant in my blood. B. 1 Cor 10:16 The cup of blessing which we bless, is it not a partaking in the blood of Christ? The bread which we break, is it not a partaking in the body of Christ? C. Luke 24:35 They recognized him in the breaking of the bread. D. 1 Cor 11:29 For anyone who eats and drinks without recognizing the body of the Lord eats and drinks judgment on himself. This last quote is from our Gospel for today’s feast. The passage is a profound theology of the Eucharist from Jesus himself and he makes it clear that we are not permitted to think of the Eucharist in symbolic or metaphor. As he speaks the words, the bread is my flesh, the Jewish people hearing him grumbled in protest. Jesus did not seek to reassure them or insist that we was speaking only symbolically when he said they must eat his flesh. Rather he becomes even more adamant by shifting his vocabulary from the polite form of eating, φάγητε (phagete – meaning simply “to eat”) to the impolite form, τρώγων (trogon – meaning to “munch, gnaw or chew”). So insistent was he that they grasp this that he permitted the fact that most left him that day and would no longer follow in his company due to this teaching (cf Jn 6:66). Yes the Lord paid quite a price for his graphic and “hard” teaching (Jn 6:60). Today, he asks us, Do you also want to leave me? (Jn 6:67). We must supply our answer each time we approach the altar and hear the word, The Body of Christ. It is here that we answer the Lord, Amen as if to say, Lord, to whom shall we go, you have the word of eternal life! (Jn 6:68). Would that people grasped that the Lord himself was truly present in our Churches! Were that so, one could never empty our parishes of those seeking to pray with the Lord. As it is, only 27% come to Mass regularly. This is more evidence of the narrow road and how few there are who find it. As Jesus experienced that most left him, so too many continue to leave him or stand far away, either through indifference or false notions. What father would not be severely alarmed if one of his children stopped eating. Consider too God’s alarm that many of us have stopped eating. This leads us to the next point. II. The Requirement of the Eucharist – And here is where the title “Unless!” comes in. When I was a kid I just thought of Church and Communion as something my mom made me do, it was just rituals and stuff. I never thought of it as essential for my survival. But Jesus teaches something very profound in John’s Gospel today when he was teaching about Holy Communion (the Eucharist). In effect he says that without Holy Communion we will starve and die spiritually. As a kid and even a young adult I never thought of Holy Communion as essential for my life, as something that, if I didn’t receive it regularly, I would die spiritually. But it makes sense doesn’t it? If we don’t eat food in our physical lives we grow weak and eventually die. It is the same with Holy Communion. Remember in the Book of Exodus: the people were without food in the desert and they feared for their lives. So God gave them bread from heaven called “manna” that they collected each morning. Without eating that bread from heaven they would never have made it to the Promised Land, they would have died in the desert. It is the same with us. Without receiving Jesus, our Living Manna from heaven in Holy Communion we will not make it to our Promised Land of Heaven! I guess it’s not just merely a ritual after all. It is essential for our survival. Don’t miss Holy Communion! Jesus urges you to eat. A mother and father in my parish recently noticed their daughter wasn’t eating. Within a very short time they took her to the doctor who discovered the problem and now the young girl is able to eat again. Those parents would have moved heaven and earth to make sure their daughter was able to eat. It is the same with God. Jesus urges us to eat, to receive the Holy Communion every Sunday without fail. Jesus urges us with this word: “Unless!” Holy Communion is our required food. A. Remember how for forty years now the LORD, your God, has directed all your journeying in the desert…and then fed you with manna (Deut 8). C. Do this in remembrance of me…. (1 Cor 11:24 inter al). Are you a mouse or a man? Back in seminary days we were all given the example of a mouse who runs across the altar and takes a consecrated host and runs off and eats it. And we were asked, “Does he eat the body of Christ?” Yes! For the Eucharist has a reality unto itself. “But does he receive a sacrament?” No! A mouse has no mind. It eats the very Body of Christ but to no avail for it has no conscious awareness or appreciation of of what (whom) it eats. And so here comes the question – Are you a mouse or a man? How do you receive Holy Communion? Do you go up mindlessly, shuffling along in the Communion line in a mechanistic way? Or do you go up powerfully aware of He, whom you are bout to receive? Do you remember, do you have vividly present to your mind what the Lord has done for you? Are you grateful and amazed at what he has done and what he offers? Or are you just like a mouse having something mindlessly put into your mouth? Some people put more faith in Tylenol than they do the Eucharist. Why? Because when they take Tylenol they actually expect something to happen, for the pain to go away, and for there to be relief and healing. But when it comes to Holy Communion, they expect next to nothing. To them, it’s just a ritual, time to go up and get the wafer, (pardon the expression). Really?! Nothing? How can this be? Poor catechesis? Sure. Little faith? Sure. Boredom? Yes indeed. At some level it can be no better than a mouse eating a host. We are receiving the Lord of all creation, yet most expect little. Jesus is more powerful than Tylenol and we are men (and women) not mice. On this Solemnity of the Body of Christ we are summoned to deepen our faith in the Lord, present in the Eucharist, and acting through his Sacraments. Routine may have dulling effects, but it cannot be so that we receive the Lord of glory each Sunday in any way that would be called mindless. Ask the Lord to anoint your mind so that you remember and never forget. A mystery though, is not something wholly unknown. In the Christian tradition the word “mystery,” among other things, refers to something partially revealed, much more of which lies hid. Thus, as we ponder the teaching on the Trinity, there are some things we can know by revelation, but much more is beyond our reach or understanding. It is our experience that if there is only one of something, and I possess that something fully, there is nothing left for you. Yet, mysteriously each of the Three Persons fully possess the one and only Divine Nature fully, while remaining distinct persons. Wowza! A careful and clear masterpiece, but one which baffles the mind as its words and phrases come forth. So deep is this mystery that we had to “invent” a paradoxical word to summarize it: Triune (or Trinity). “Triune” literally means, “Three-one” (tri+unus) and “Trinity is a conflation of “Tri-unity” meaning the “three-oneness” of God. If all this baffles you, good! If you were to say, you fully understood all this, I would have to call you a likely heretic. For the teaching on the Trinity, while not contrary to reason per se, does transcend it and surely it transcends human understanding. II. The Teaching on the Trinity Exhibited : Scripture too, presents images and pictures of the Trinity. Interestingly enough most of the pictures I want to present are from the Old Testament. 1. Then God said, “Let us make man in our image, after our likeness… (Gen 1:26) So God speaks to himself in the plural: “let us….our.” Some claim this is just an instance of the “Royal We” being used. Perhaps but I see an image of the Trinity. There is one (“God said”) but there is also a plural (us, our). Right at the very beginning in Genesis there is already a hint that God is not all by himself, but is in a communion of love. We have entered into perilous times where our interdependence and communal influence are under-appreciated. That attitude that prevails today is a rather extreme individualism wherein “I can do as I please.” There is a reduced sense at how our individual choices affect the whole of the community, Church or nation. That I am an individual is true, but it is also true that I live in communion with others and must respect that dimension of who I am. I exist not only for me, but for others. And what I do affects others, for good or ill.
What a wondrous and challenging feast we celebrate at Pentecost. A feast like this challenges us, because it puts to the lie a lazy, sleepy, hidden, and tepid Christian life. The Lord Jesus had said to Apostles, and still says to us: I have come to cast a fire on the earth! (Luke 12:49). This is a feast about fire, about a transformative, refining, and purifying fire that the Lord wants to kindle in us and in this world. The Holy Spirit comes to quicken the Church, give her courage and get her to step out on her mission to bring Christ to the ends of the earth. The Church is not a mere clubhouse, she is a light house, and the fire with which she is meant to shine is the Holy Spirit himself. In the readings today we find about 120 people all huddled, still in fear, in an upper room. Today, the Church breaks the huddle and executes the play, the locked doors fly open and she goes forth, unto all the nations. The Readings today speak to us of the Holy Spirit in three ways: The Portraits of the Spirit, the Proclamation of the Spirit and the Propagation by the Spirit. Let’s look at all three. I. The Power of the Spirit – The Reading today speaks of the Holy Spirit using two images: rushing wind, and tongues of fire. Both these images speak of how the Lord empowers the individual and the Church with new life and passionate intensity. These two images also recall Psalm 50 which says, Our God comes, he does not keep silence, before him is a devouring fire, round about him a mighty tempest. (Psalm 50:3). Rushing Wind – Notice how the text from Acts opens: When the time for Pentecost was fulfilled, they were all in one place together. And suddenly there came from the sky a noise like a strong driving wind, and it filled the entire house in which they were. This text brings us to the very root meaning of the word “Spirit.” For “spirit” refers to “breath,” and we have this preserved in our word “respiration,” which means breathing. So, the Spirit of God is the breath of God, the Ruah Adonai (the Spirit, the breath of God). Genesis 1:2 speaks of this saying the Spirit of God was moving over the face of the waters. And Genesis 2:7 speaks even more remarkably of something God did only for man, not the animals: then the LORD God formed man of dust from the ground, and breathed into his nostrils the breath of life; and man became a living soul (Gen 2:7). So the very Spirit of God was breathed into Adam! But, as we know, Adam lost this gift and died spiritually when he sinned. Thus we see in this passage from Acts an amazing and wonderful resuscitation of the human person as these first Christians (120 in all) experience the rushing wind of God’s Spirit breathing spiritual life back into them. God does C.P.R. and brings humanity, dead in sin, back to life! The Holy Spirit comes to dwell in us once again as in a temple (cf 1 Cor 3:16). It has been said that Christmas is the feast of God with us, Good Friday is the Feast of God for us, but Pentecost is the Feast of God in us. Tongues of Fire – The text from Acts says, Then there appeared to them tongues as of fire, which parted and came to rest on each one of them. The Bible often speaks of God as fire, or in fiery terms. Moses saw God as a burning bush. God led the people out of Egypt through the desert as a pillar of fire. Moses went up on to a fiery Mt. Sinai where God was. Psalm 97 says, The LORD reigns; let the earth rejoice; let the many coastlands be glad! Clouds and thick darkness are round about him; righteousness and justice are the foundation of his throne. Fire goes before him, and burns up his adversaries round about. His lightnings lighten the world; the earth sees and trembles. The mountains melt like wax before the LORD, before the Lord of all the earth. The heavens proclaim his righteousness; and all the peoples behold his glory. (Ps 97:1-6). Scriptures call God a Holy fire, a consuming fire (cf Heb 12:29) and a refining fire (cf Is. 48:10; Jer 9:7; Zec 13:9; & Mal 3:3). And he is also preparing us for judgement, for if God is a Holy Fire, then who may endure the day of his coming or of our going to Him? What can endure the presence of Fire Himself? Only that which is already fire. Thus we must be set afire by God’s love. So, in the coming of the Holy Spirit God sets us on fire to make us a kind of fire. In so doing, he purifies and prepares us to meet him one, He who is a Holy Fire. This fire also causes us to burn with passionate intensity for God and for his kingdom. Our hearts are set afire with zeal for God and zeal for souls. With joy, holy love and burning zeal we are equipped to speak to others of God and manifest the intense love of God. Fire changes everything it touches and we are sent forth as a holy fire into this world so that, by God grace the whole world will be changed by the spreading fire of God, the Holy Spirit. Who or what have you set on fire lately? Let the Lord use you to cast fire on the earth. So behold how the Holy Spirit moves them to proclaim, not just in the safety of the upper room, but also in holy boldness before the crowds who have gathered. Notice the transformation! Moments ago these were frightened people who gathered only behind locked doors, in secrecy. They were huddled together in fear. But now they go forth to the crowds and boldly proclaim Christ. They have gone from fear to faith, from cowardice to courage, from terror to testimony! And how about us? Too many Christians are silent, dominated by fear. Perhaps they fear being called names, or not being popular. Perhaps they are anxious about being laughed at, or resisted, or of being asked questions they don’t feel capable of answering. Some Christians are able to gather in the “upper room” of the parish and be active, even be leaders. But once outside the “upper room” they slip into undercover mode. They become secret agent Christians. Well, the Holy Spirit wants to change that, and to the degree that we have really met Jesus Christ and experienced his Holy Spirit we are less “able” to keep silent. An old Gospel song says, I thought I wasn’t gonna testify, but I couldn’t keep it to myself, what the Lord has done for me. The Holy Spirit, if authentically received, wants to give us zeal and joy, and burn away our fear, so that testifying and witnessing are natural to us. Note also how the Spirit “translates” for the apostles, for the crowd before them spoke different languages, but all heard Peter and the others in their own language. The Spirit therefore assists not only us, but also those who hear us. My testimony is not dependent only on my eloquence, but also on the grace of the Holy Spirit who casts out deafness and opens hearts. Every Christian should remember this. Some of our most doubtful encounters with others can still bear great fruit on account of the work of the Holy Spirit who “translates” for us and overcomes many obstacles that we might think insurmountable. III. The Pattern of the Spirit – In the great commission the Lord said, Go, therefore, and make disciples of all nations, baptizing them in the name of the Father, and of the Son, and of the Holy Spirit, teaching them to observe all that I have commanded you. And behold, I am with you always, until the end of the age (Matt 28:19ff). He also said, as we have noted, I have come to cast a fire on the earth and How I wish the blaze were already ignited (Luke 12:49). But how is the Lord going to do this? Perhaps a picture will help. My parish church is dedicated to the Holy Spirit under the title: Holy Comforter. Above the high altar is the Latin inscription: Spiritus Domini, replevit orbem terrarum (The Spirit of the Lord, filled the orb of the earth). (See photo, above right, of our high altar). And yet, we may wonder how He will do this. But the walls of my parish Church answer the question. The clerestory walls are painted Spanish Red, and upon this great canvas are also painted the lives of 20 saints, surrounding us like a great cloud of witnesses (cf Heb 12:1). (See also, video below). And over the head of every saint is a tongue of fire. THIS is how the Spirit of the Lord fills the earth. It is not “magic fairy dust,” it is in the fiery transformation of every Christian, going forth into the world to bring light and warmth to a dark and cold world. THIS is how the Lord casts fire on earth, THIS is how the Spirit of the Lord fills the orb of the earth: in the lives of saints, and, if you are prepared to accept it, in YOU. In the end, the Great Commission (Matt 28) is “standing order No. 1.” No matter what else, we are supposed to do this. Parishes do not deserve to exist if they do not do this. We as individual Christians are a disgrace, and not worthy of the name, if we fail to win souls for Jesus Christ. The Spirit of the Lord is going to fill the orb of the earth, but only through us. The spread of the Gospel has been placed in your hands (scary isn’t it?). Two years ago, my own parish, after a year of training, stepped out into our neighborhood, and went door to door and into the local park. And we announced Jesus Christ to over 1500 homes, and invited people to discover him in our parish, and in the sacraments. We have also taken our May procession to the Local Park. This year we have been doing one on one Evangelization and have made the commitment to the Lord to strive to bring one soul back to his house and the Sacraments. This fall we are heading into the park to do Eucharistic flash mobs (see video below). 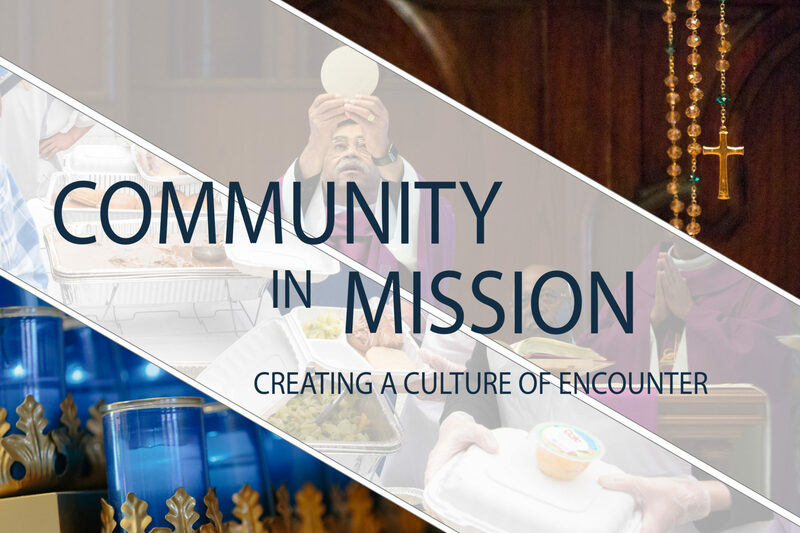 Before we count even a single convert, this is already success because we are obeying Jesus Christ who said, simply, “Go!” “Go make disciples.” And, truth be told, we ARE seeing an increase in my parish. Our Sunday attendance has grown from about 450 to 520, a 15% increase. We are growing, and our attendance, while average for a downtown city parish, is going in the right direction. God never fails. God is faithful. Spread the news: it works if you work it, so work it because God is worth it. Go make disciples. Ignore what the pollsters tell you about a declining Church and let the Lord cast a fire on the earth through you! Fires have way of spreading! Why not start one today? The Spirit of God will not disappoint. I know this, my parish has a future because we are obeying Jesus Christ, we are making disciples. How about you and yours? If parishes do not obey, they do not deserve to exist and can expect to close one day, no matter how big they are today. I, in my short 50 years on this planet, have seen it: parishes once big, booming, and, (frankly), arrogant, are now declining and some are near closure. It happens to the best, if they do not evangelize, if they do not accomplish “Job 1.” The Lord wants to light a fire. Why not become totally fire? Let the Spirit propagate the Church through you (I am not talking about the person next to you, I am talking to you). Happy feast of Pentecost. But don’t forget that the basic image is very challenging, for it means getting out of the “upper room,” opening the doors, and proclaiming Christ to the world. Let the Holy Spirit light a fire in you, and then, you can’t help but spread light and heat to a cold and dark world. Let the evangelization of the whole world begin with you. This video features details from the clerestory (upper window level) of my parish of Holy Comforter here in DC. Notice the tongue of fire above each saint. The paintings show how the Spirit of the Lord fills the orb of the earth, (see photo above), through the lives of the lives of the saints (this means you). It is not magic, it is grace, working in your life, through your gifts, and your relationships, that the Lord will reach each soul. The cloud of witnesses on the walls of my Church say simply, You are the way he will fill the earth and set it on fire. Let the blaze be ignited in you! The song says: We are surrounded by a great cloud of witnesses, looking on, encouraging us to do the will of the Lord. Let us stand worthy, and be faithful to God’s call….We must not grow weary…! In more dioceses than not, the Feast of the Ascension is celebrated this weekend. The liturgist in me regrets the move, but here we are any way. So let’s ascend with the Lord, three days late! This marvelous feast is not merely about something that took place two thousand years ago. For, though Christ our head has ascended, we the members of his body are ascending with him. Since he was ascended, we too have ascended. In my own life, as a Christian, I am brought higher every year by the Lord who is drawing me up with him. This is not some mere slogan, but something I am actually experiencing. An old song says, I was sinking deep in sin, far from the peaceful shore. Very deeply stained with sin, sinking to rise no more. But he master of the sea, heard my despairing cry. And from the waters lifted me. Now safe am I. Love Lifted me, When nothing else could help. Love lifted me! Yes, the feast of the Lord’s Ascension is our feast too, if we are faithful. Let’s look at it from three perspectives. A. The Reality – Imagine the glory of this moment. Scripture says, As they were looking on, he was lifted up and cloud took him from their sight….they were looking intently in the sky as he was going (Acts 1:9). So impressive was the sight that the angels had to beckon them to get along to Jerusalem as the Lord had said, Men of Galilee,” they said, “why do you stand here looking into the sky? This same Jesus, who has been taken from you into heaven, will come back in the same way you have seen him go into heaven (Acts 1:11). Yes, it was glorious. Jesus had once said as a summons to faith, What if you were to see the Son of Man ascending to where he was before? (John 6:62). He had also encouraged them saying: Truly, truly, I say to you, you will see heaven opened, and the angels of God ascending and descending upon the Son of man (John 1:51) So here is a glorious reality, and a fulfillment of what Jesus had said. B. The Rescue – In the Ascension, it does not seem that the Lord entered heaven alone. As we have remarked, in his mystical body we also ascend with him. But consider too this remarkable text that affirms that: Therefore it is said, “When he ascended on high he led a host of captives, and he gave gifts to men. In saying, “He ascended,” what does it mean but that he had also descended into the lower parts of the earth? He who descended is he who also ascended far above all the heavens, that he might fill all things (Eph 4:8ff). Yes, the Lord had earlier, just after his death, descended to Sheol and awakened the dead and preached the gospel to them (cf 1 Peter 4:6). And now, for those he had justified, came the moment ascend with Jesus as a “host,” as an army of former captives, now set free. Behold the great procession that enters behind Christ through the now opened gates of heaven: Adam and Eve, Noah, Abraham, Sarah, Isaac Jacob, Rachel, Judith, Deborah, David, Samuel, Isaiah, Jeremiah, Ezekiel, Malachi, John the Baptist….and one day you! Yes this is a great rescue. Adam and his descendants have not simply been restored to some paradisical garden, they have entered heaven. C. The Rejoicing – Consider how, this once captive train, sings exultantly as they follow Christ upward to heaven. The liturgy today puts before us a likely song they sang: God mounts his throne to shouts of Joy! The Lord amid trumpet blasts. All you peoples clap your hands, shout to God with cries of gladness, for the Lord the most high, the awesome is the great king over all the earth. God reigns over the nations, God sits upon his holy throne (Psalm 47:6-7). I also have it on the best of authority that they were singing an old gospel song: I’m so glad, Jesus lifted me! Yes I also have it on the best of authority that they were even singing an old Motown song: Your love is lifting me higher, than I’ve ever been lifted before! Yes, Here are some glorious facets of the Ascension. II. The Fellowship of the Ascension – We have already remarked that, when Christ ascends, we ascend. Why and how? Scripture says, Now you are the body of Christ and individually members of it (1 Cor 12:27). It also says, All of us who were baptized into Christ Jesus were baptized into his death. By baptism we were buried together with him so that Just as Christ was raised from the dead by the glory of God the Father, we too might live a new and glorious life. For if we have been united with him by likeness to his death we shall be united with him by likeness to his resurrection (Rom 6:3ff). So, when Christ died we died. When Christ rose, we rose. When He ascends, we ascend. But you may say, he is in glory, but I am still here, how is it that I am ascended or ascending? Consider a humorous example about our physical bodies. When I get on an elevator and punch the button for the top floor, the crown of my head gets there before the soles of my feet. But the whole body will get there unless some strange loss of integrity or tragic dismemberment takes place. So in an analogous way it is with Jesus’ Jesus mystical body. In Christ our head we are already in glory. Some members of his body have already gotten there. We who come later will get there too, provided we stay a member of the Body. Yes we are already ascended in Christ our head. We are already enthroned in glory with him, if we hold fast and stay a member of his Body. This is the fellowship of the Ascension. A. Holy Ghost power – Jesus teaches very clearly that he is ascending in order to send us the Holy Spirit: Nevertheless I tell you the truth: it is to your advantage that I go away, for if I do not go away, the Counselor will not come to you; but if I go, I will send him to you (Jn 16:7ff) He also says, These things I have spoken to you, while I am still with you. But the Counselor, the Holy Spirit, whom the Father will send in my name, he will teach you all things, and bring to your remembrance all that I have said to you (Jn 14:25ff). And yet again, I still have many things to say to you, but you cannot bear them now. When the Spirit of truth comes, he will guide you into all the truth, for he will not speak on his own authority, but whatever he hears he will speak, and he will declare to you the things that are to come (Jn 16:13-14). So the Lord goes, that he might, with the Father, send the Holy Spirit to live within us as in a temple. In this way, and through the Eucharist, he will dwell with us even more intimately than when he walked this earth. B. Harvest – Jesus says, And I, if I be lifted up from the earth, will draw all men unto me (John 12:32). While the immediate context of this verse is the crucifixion, the wonder of John’s gospel is that is that he often intends double meanings. Clearly Christ’s glorification is his crucifixion, but it also includes his resurrection and ascension. So, from his place in glory, Christ is drawing all people to himself. He is also bestowing grace on us from his Father’s right hand to be his co-workers in the harvest: But you shall receive power when the Holy Spirit has come upon you; and you shall be my witnesses in Jerusalem and in all Judea and Samaria and to the end of the earth (Acts 1:8). Yes, from his place in glory, Christ is bringing in a great harvest, as he said in Scripture: Do you not say, ‘Four months more and then the harvest’? I tell you, open your eyes and look at the fields! They are ripe for harvest. Even now the reaper draws his wages, even now he harvests the crop for eternal life, so that the sower and the reaper may be glad together. Thus the saying ‘One sows and another reaps’ is true. I sent you to reap what you have not worked for. Others have done the hard work, and you have reaped the benefits of their labor.” (Jn 4:35-38). Harvest! And it is the Lord’s work from heaven in which we participate. C. Help – At the Father’s right hand Jesus intercedes for us. Scripture says, Consequently he is able, for all time, to save those who draw near to God through him, since he lives always to make intercession for them (Heb 7:25). The Lord links his ascension to an unleashing of special power: Amen, amen, I say to you, he who believes in me will also do the works that I do; and greater works than these will he do, because I go to the Father. Whatever you ask in my name, I will do it, that the Father may be glorified in the Son (Jn 14:12). It is true, we must not understand asking in the name of Jesus as a mere incantation, for to ask in his Name means to ask in accord with his will. And yet, we must come to experience the power of Jesus to draw us up to great and wondrous things in his sight. Despite the mystery of iniquity all about us, we trust that Christ is conquering, even in the puzzling and apparent victories of this world’s rebellion. We read, In putting everything under him, God left nothing that is not subject to him. Though, at present we do not see everything subject to him, yet we see Jesus, who was made a little lower than the angels, now crowned with glory and honor….so that by his death he might destroy him who holds the power of death—that is, the devil— and free those who all their lives were held in slavery by their fear of death (Heb 2:8-9; 14-15). Thus, from heaven we have the help of the Lord’s grace which, if we will accept it, is an ever present help unto our salvation. D. Habitation – Simply put, Jesus indicates that in going to heaven he is preparing a place for us: In my Father’s house are many mansions: if it were not so, I would have told you. I go to prepare a place for you. 3 And if I go and prepare a place for you, I will come again, and receive you unto myself; that where I am, there ye may be also (Jn 14:2ff) Yes, indeed, He has the blueprints out, and a hard hat on. He is overseeing the construction of a mansion for each of us that we may dwell with him, the Father and the Spirit forever. Here then are the ways that Christ, by his love is lifting us higher, than we’ve ever been lifted before. Yes, love lifted me, when nothing else could help, Love lifted me. In this reflection, perhaps we can consider but one line in the Gospel which both challenges our love, and is a sign of God’s humble and abiding love for us: For there was no room for them in the Inn. I. The Scene – There is a knock at midnight. Joseph speaking on behalf of both Mary and Jesus (who is in her womb still), seeks entrance to the homes and lodgings of those in Bethlehem. And though the Jewish people, in those ancient days, placed a high obligation upon the duty of hospitality to the stranger and passerby, the answer is repeatedly, “No room here.” Mary’s obvious pregnancy and imminent delivery make little difference, it would seem. This indeed is a cold night, not so much in terms of the air temperature, but in terms of the hearts of the people. Even at the local Inn, (Surely someone could make room for a pregnant woman! ), No room at the Inn. Yes! A cold night. The only warmth will be found among the animals of that town. An old Latin antiphon for Christmas says, O magnum mysterium et admirabile sacramentum, un animalia viderent Dominum natum iacentem in praesepio. (O great mystery and stunning sacrament, that animals would see the newborn Lord lying in a feedbox). Here warmth will be found, among the animals. It is sometimes said that man can be brutish. But the reality is that we can sink even beneath the beasts, doing things to ourselves and to each other that even animals do not do. He was in the world, and though the world was made through him, the world did not recognize him. He came to that which was his own, but his own did not receive him (John 1:10-11). II. The Stooping – Surely God stoops low to come from lightsome heaven to our war torn, dark and cold world. And as he stoops, he stoops to the lowest place, being born not in a palace or even a comfortable home. He stoops to a manger. For God will defeat Satan’s pride with humility. And all who will find him this fateful night must also stoop. And this stooping of God is illustrated even in the very topography of this night. The towns of the Holy Land built on the tops of the tall hills (something we almost never do here in America). But this is done (where land is more scarce) so as to leave the fertile valleys for agriculture. And Bethlehem too is perched on the higher land and the shepherd’s fields lie below. The streets of Bethlehem are steep and built on tiers or levels. Thus, the back lot of many homes and buildings drops steeply down and beneath the buildings. And beneath the buildings they hollowed out caves where animals and tools and tools were kept. It was there, down under, where Joseph and Mary sought hasty shelter, for it was a cold and dark midnight, and Mary’s time had come. God stoops with them to be born, among the animals and agricultural implements, in the damp under-cave of some house or inn. And, for those who will find our God. They too must stoop low. Even to this day when one visits Bethlehem and wants to see the place of Jesus’ birth, one must first enter the Church through what is termed the “Door of Humility.” For security reasons this ancient door was built only about four feet high. And one must stoop greatly to enter the church. Yes, we must stoop to find our God. The site of the birth is at the other end of the basilica, under the altar area. Here again, more stooping; down steep stairs and through another low and narrow door, into the cave. To touch the spot, one must kneel and reach forward, into a narrower part of the cave. Here Jesus Christ was born of the Virgin Mary, says the inscription. And the only to get there is to stoop. Yes, Our God stoops, he stoops to the lowest place, and to find him, and be with him we too must be willing to stoop. God hates pride, he just can’t stand it. For he sees what it does to us and he comes to break its back, not with clubs and swords, or by overpowering, but with humility. Darkness does not defeat darkness, only light can do that. Hate does not defeat hate, only love can do that. Pride will not defeat Pride, only humility will do that. So God stoops. And tonight God calls us with this same humility. He could have ridden down from Heaven on a lightning bolt and stunned us into fearful submission. Instead he goes to the lowest place. He comes quietly, non-violently, without threat, as an infant. But even in this lowly way, he is still calling. III. The Saddest thing – When human history is complete and the last books are written, one of the saddest lines in all of that history will be simply the line, For there was no room for them in the Inn. No room, no room. How strange and sad for this world that God simply doesn’t fit. He does fit our agendas, our schedules, our priorities. No room, He just doesn’t fit. What could be more sad than to miss this gift to become the very Children of God? Yes, the saddest line that will ever be written of this world is that there was no room for him in the Inn. And what of us? Is there room for Jesus in the “Inn” of our hearts? For if there is, Jesus comes bearing many gifts. Tonight is a night of gifts. There is a knock at this very midnight. Sounds like Jesus! Oh Sinner, why don’t you answer, somebody’s knocking at your door. Make room for Jesus. Every year he comes knocking, he stoops low and invites us to find him in the lowly places of this world, in the lowly places of our own life. What are the things in your life that may be crowding out Jesus? What obstacles and preoccupations leave little or no room for Jesus? What keeps you from recognizing him and opening the door wide when he comes? If you’ve already opened the door to him for many years, praise God, and ask the Lord to help you open wider. For it remains true for many of us that although Jesus has been invited in, his accommodations are poor, perhaps the couch or the floor. Make room for Jesus, make more and more room for him, in the Inn of your soul and I promise you that what Scripture says is true: Yet to all who did receive him, to those who believe in his name, he gave the power to become children of God— (John 1:12). If you will receive the gift of him tonight, and make greater room for him in your heart, I promise you total victory and transformation in Christ Jesus. There will come to you the increasing gift of transformation into the very likeness of God. For tonight is a night of gifts and Jesus stoops low to give us a priceless gift: the power to become the children of God. It’s midnight…. there is a knock at the door.